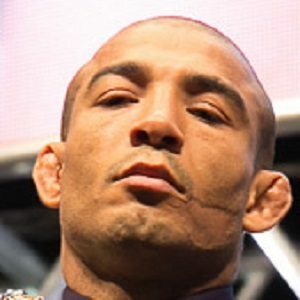 José Aldo da Silva Oliveira Junior is a Brazilian mixed martial artist. He is the former two time UFC Featherweight champion and former WEC Featherweight champion. He was on an 18-fight 10 year unbeaten streak before he lost his belt to super star Conor McGregor. He regained his championship, only to lose it to Max Holloway. He fights out of Nova Uniao with team mate and former champion Renan Barao. He was born on the 9th of September 1986 in Manaus, Brazil. When he was a baby his sister dropped him on a barbecue, which left a permanent scar on his face. Originally Aldo wanted to be a football player, but after he got fed up with getting beat up in the streets on Manaus, he started training Capoeira. When he was 17 years old he made the move to Rio de Janeiro with nothing but the clothes on his back and a dream to make it in MMA. He made his MMA debut in 2004 and won his seven first fights before he lost by submission to Luciano Azevedo. He won three fights after the loss and got the chance to compete in the biggest organisation carrying his weight class, World Extreme Cagefighting. Jose Aldo made his WEC debut in 2008 against Alexandre Franca Nogueira. He made quick work of his opponent and kept on finishing his opposition all the way to the title. His run before the title shot included Jonathan Brookins and Cub Swanson. On November 18th 2008 Jose Aldo finally got his shot at the WEC Featherweight Champion Mike Thomas Brown. Aldo won by TKO in the second round. He followed his destruction of Brown with a dismantling of Urijah Faber over five rounds. He hit Faber with so many leg kicks in the fight that Fabers leg looked mangled for several days. He defended his title against Manny Gamburyan by second round TKO before the WEC folded into the UFC. Jose Aldo became the UFC champion by default when the WEC folded into the UFC. Aldo defended his title against Canadian Mark Hominick, a fight he won by unanimous decision. He defended his title a total of seven times. He beat the tough Chad “Money” Mendes twice, the first time by knockout and the second time by a convincing decision. He also beat the legend Frankie “The Answer” Edgar by decision. Chan Sung Jung, Ricardo Lamas and Kenny Florian also fell victim to Aldos reign. After Conor McGregor won the interim title against Mendes, he got the shot to fight Aldo. After a world tour where McGregor had alot of opportunities to harrass Aldo and get into his head, the two finally met at UFC 194: Aldo vs. McGregor the 12th of December 2015. McGregor knocked Aldo out in 13 seconds and ended Aldos reign as the featherweight champion, for now. This marked the first time in Aldos career where he was stopped by strikes. He won the interim title in a fight at UFC 200 against familiar foe Frankie Edgar. He won an even more dominant unanimous decision. When McGregor was stripped of the belt after beating Eddie Alvarez, Aldo again became the undisputed champion. Max Holloway fought Anthony Pettis for the interim title even though Aldo was active a few months prior. After Holloway beat Pettis to become the interim champion, Aldo and Holloway faced off to unify the titles. the fight took place the third of June 2017 at UFC 212: Aldo vs. Holloway. Holloway won by TKO in the third round and was now the reigning, defending, undisputed UFC Featherweight Champion of the World. The rematch took place a couple of months later with basically the same result, Holloway winning by TKO in the 3rd round. At time of writing UFC has no planned fight for Jose Aldo.